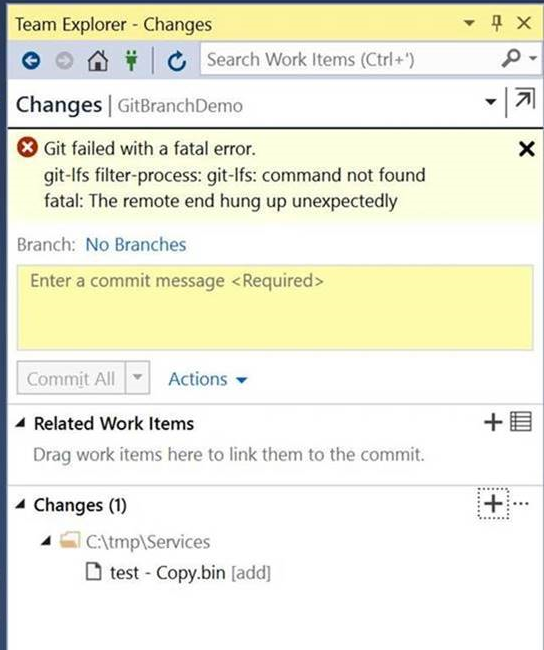 Fixing a ‘git-lfs filter-process: gif-lfs: command not found’ error in Visual Studio 2017 – But it works on my PC! I am currently looking at the best way to migrate a large legacy codebase from TFVC to Git. There are a number of ways I could do this, as I have posted about before. Obviously, I have ruled out anything that tries to migrate history as ‘that way hell lies’; if people need to see history they will be able to look at the archived TFVC instance. TFVC and Git are just too different in the way they work to make history migrations worth the effort in my opinion. So as part of this migration and re-structuring I am looking at using Git Submodules and Git Large File System (LFS) to help divide the monolithic code base into front-end, back-end and shared service modules; using LFS to manage large media files used in integration test cases. 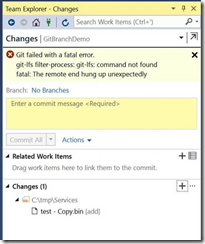 Firstly there are known limitations with Git submodules in Visual Studio Team Explorer. At this time you can clone a repo that has submodules, but you cannot manage the relationships between repos or commit to a submodule from inside Visual Studio. There is a request on UserVoice to add these functions to Visual Studio, vote for it if you think it is important, I have. The big problem I had was with LFS, which is meant to work in Visual Studio since 2015.2. On reading around this error it suggested that the separate git-lfs package needed to be installed. I did this, making sure that the path to the git-lfs.exe (C:\Program Files\Git LFS) was in my path, but I still had the problem. This is where I got stuck and hence needed to get some help from the Microsoft Visual Studio support team. After a good deal tracing they spotted the problem. The path to git-lfs.exe was at the end of my rather long PATH list. It seems Visual Studio was truncating this list of paths, so as the error suggested Visual Studio could not find git-lfs.exe. It is unclear to me whether the command prompt just did not suffer this PATH length issue, or was using a different means to resolve LFS feature. It should be noted from the command line LFS commands were available as soon as I installed Git 2.16.2. I did not have to add the Git LFS package. So the fix was simple, move the entry for ‘C:\Program Files\Git LFS’ to the start of my PATH list and everything worked in Visual Studio. It should be noted I really need to look at whether I need everything in my somewhat long PATH list. It’s been too long since I re-paved my laptop, there is a lot of strange bits installed. Thanks again to the Visual Studio Support team for getting me unblocked on this.